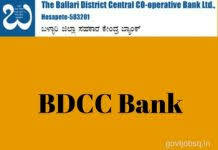 The Ballari District Central Cooperative Bank (BDCC Bank) is inviting online applications for filling up the posts of Second Division Assistants (SDAs), Typists & Attenders for the year 2017 on a permanent basis. There are 62 Posts in total. You can apply online from 7th November 2017 to 4th December 2017. Check complete details below.